Disclosure: I received this product in exchange for my honest and unbiased opinion. This blog post contains affiliate links. Growpetz Retractable Leash is a very nice leash for many reasons. This leash is intended for dogs up to 45 pounds and it extends 13 feet. The thing I like most about this leash is the handle. It has a ergonomic design, it is made of a soft silicone non-slip material, and it is light weight. At the time I tested this leash, I had another leash in my right hand and this handle was much more comfortable. I would get it an A+ for comfort. Another thing I like about this #Retractabldogleash is the hook, which attaches to the collar or harness of the dog. It is a heavy duty hook and it’s easy to open. I was worried about the hook being too heavy for my small dogs, but it is fairly light weight also. The leash has a strong nylon belt which is important for larger dogs. It is very durable, light weight, and bright colored which makes it easy to see by those passing by and the person walking the dog. There was one issue I found with the belt. When my dog headed directly to the left or right of me, the belt got caught in the handle and didn’t retract until the dog moved back in front of me. This wasn’t a big issue, I just noticed that the other leash I was using didn’t act this same way. Lastly, the retractable mechanism works nicely. 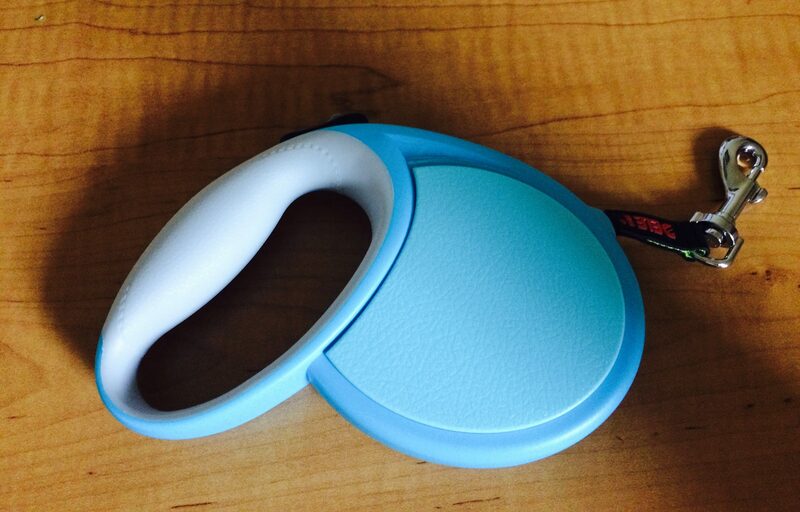 The mechanism allows for easy locking of the leash. With one push forward, the leash locks into position. Push the button down to pause the extension and retract the leash. It is really that easy. I would recommend this leash for all the reasons listed above. Please see my video below about Growpetz Retractable Leash.